This may sound a little odd, but I have always wanted to walk Alpacas, it's been on my bucket list for a rather long time. 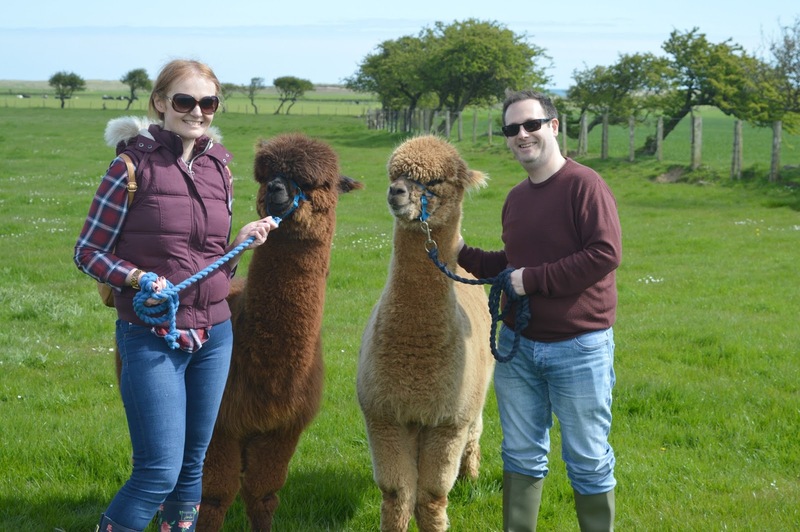 So I was very excited when our friends at The Bells of Hemscott played fairy godmother and invited Simon and I to their farm in Northumberland to meet their herd of Alpacas and take them for a little stroll. This isn't the first time the Bells of Hemscott have made my wishes come true, last year they treated us to a night of glamping in their Shepherds Hut, an experience that I loved. Simon wasn't so sure about glamping but I was hopeful that Alpaca Walking might be a little more up his street. The Alpacas at Hemscott Hill Farm are Huacaya Alpacas and are the most adorable fellas I've ever met. Allow me to introduce you to Wesley, Dillon, Faustus, Samuel, Rowley and Hector. We began our trip with an introduction from our guide Alison who gave us some advice on how to handle the Alpacas and what we could expect from our walk. 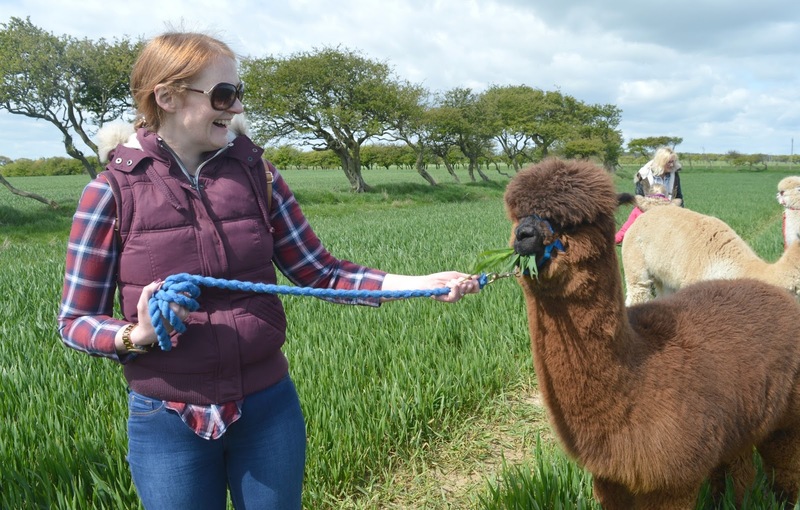 I will admit I did begin to get a little nervous when she told us exactly how to hold the rope and then brought the Alpacas out of their paddock to meet us. They were so much bigger on our side of the wall! Alpacas are pack animals so have to be walked together with their mate. 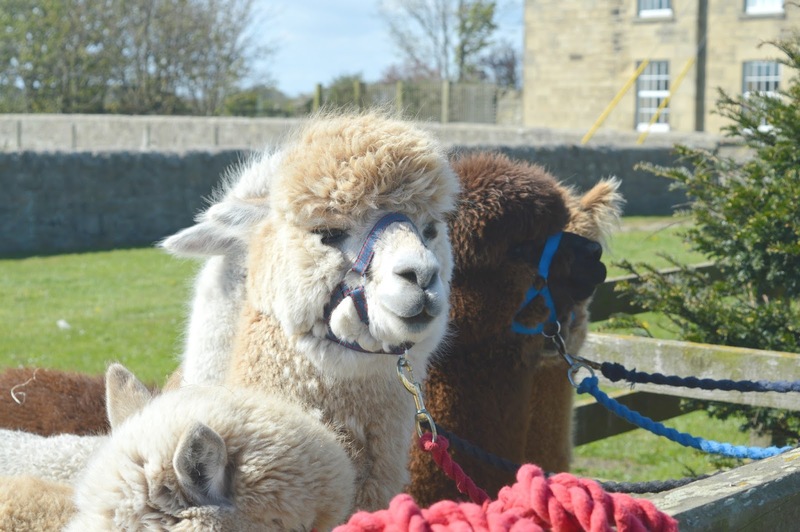 Each Alpaca has a best buddy to walk alongside meaning that you walk the animals in pairs with you and your walking partner each side of them. Simon and I were thrilled to be given Faustus and Samuel for the walk, two very fine looking lads with soppy eyes and gorgeous floppy hair. Alison had advised us to try to ignore our Alpacas for the first 10 minutes to give them time to get used to us so we calmly strolled them off through the farm, trying to ignore the fact that we were walking next to such beauties. 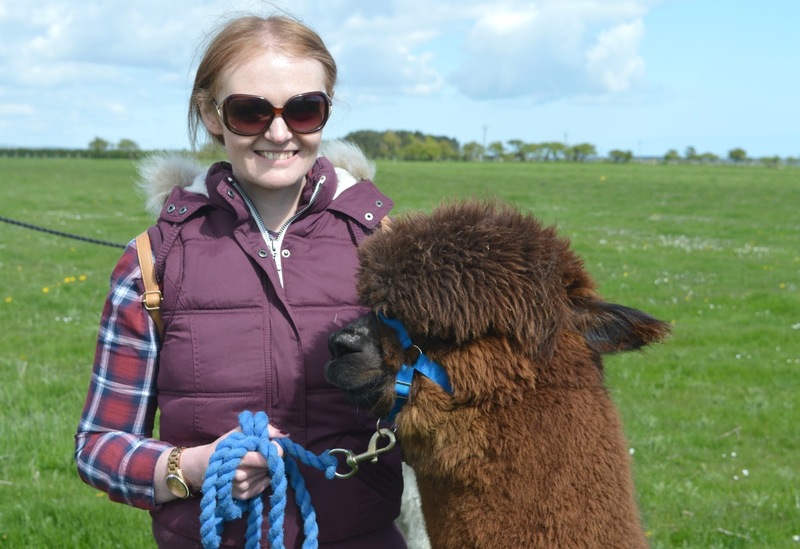 The Alpaca walk at Hemscott Farm is a lovely slow amble through farm land, which is especially beautiful on a gorgeous sunny day and allows plenty of time to chat to your fellow walkers and ask Alison plenty of questions about her furry friends. In no time at all Samuel and I had bonded and I was so happy when he let me stroke him and then let me have a cuddle. That was it, Sammy and I were firm friends and I knew I was going to be reluctant to give him back. Simon's Alpaca, Faustus was equally soppy but was adamant to eat as much grass as he possibly could each time we stopped walking for more than a second. It made us laugh as he reminded us a lot of a certain Mr Simon! Feeling comfortable with Sammy as we bonded through our walk I had a slightly loser grip on the rope and spent my time chatting to him and stopping for a cuddle at every opportunity. Sammy had me in stitches when I turned to chat to him half way through our walk only to find he'd grown a beard of grass. I'd turned my back for all of 2 seconds and he'd taken the opportunity to grab the biggest mouthful of long grass. I guess he'd decided it was lunchtime. I was surprised at how full of character the Alpacas were and a lot of comedy on our walk was provided by Welsey and Dillon, who were adamant that they wanted to be leading the pack one second and then not being bothered to move the next. Once we'd bonded with our Alpacas there was plenty of time for photo ops and let me tell you Alpacas love posing for the camera. Sammy and I had a great time taking selfies. After a lovely amble back we got the opportunity to feed our Alpacas their carrot treats before it was time to say goodbye. Not going to lie, I was gutted to hand Sammy back to Alison, but after one last big fluffy cuddle we climbed back into our car and returned to reality. 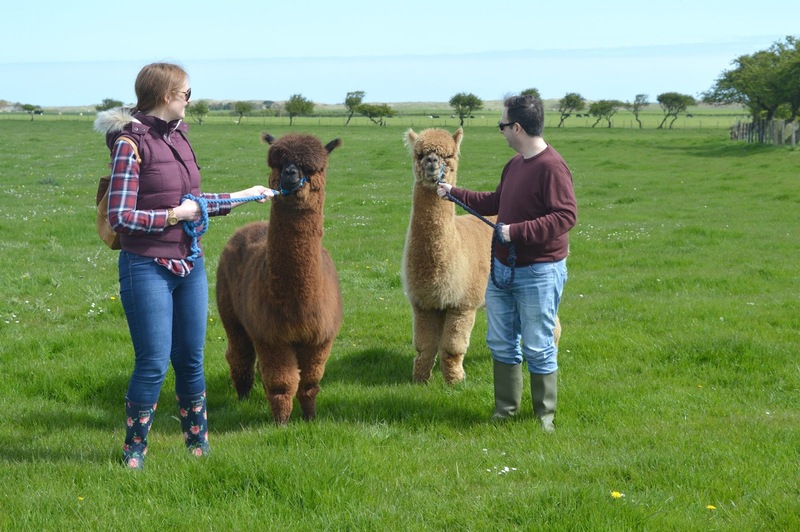 With a small herd of 6 Alpacas the walks at Hemscott Farm are really personal with plenty of one on one time with the Alpacas and lots of opportunity to learn more about the gorgeous animals. 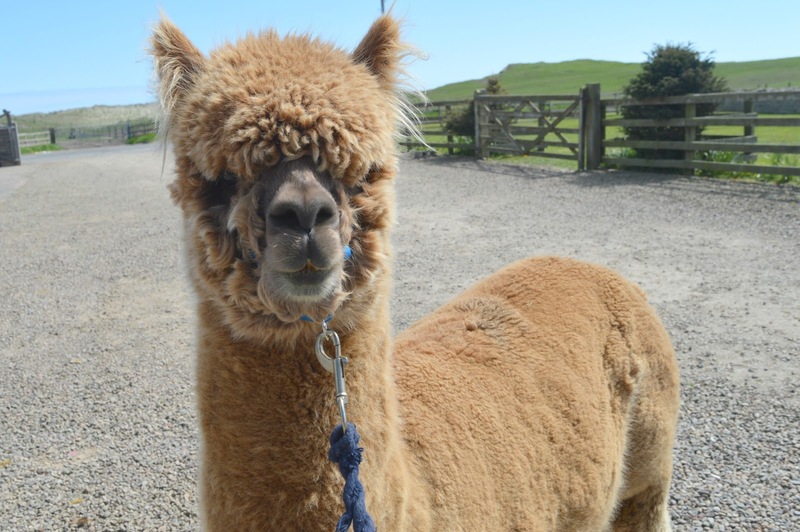 Alpaca walks cost £20 per person with an alpaca and £7.50 per accompanying person for an hour trek. For more information and to book see here. 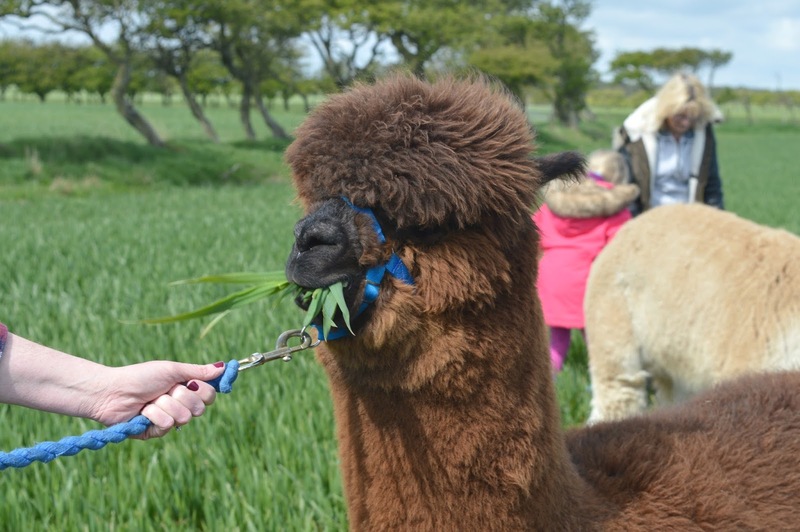 Thank you to The Bells of Hemscott for inviting us on the Alpaca Walking experience. All opinions in this review are our own. Oh my goodness this is just the sweetest thing ever! I already adore Samuel ........ wonder if he would like to come to your wedding?? They are so cute!! I walked an alpaca before, but only for a few minutes. I would love to go on a longer trek.